The3dForce: Why Did Russian Cyber Forces Beat Their U.S. Adversaries in 2016? The Answers Is Rooted In The State Of Education In The U.S.
Why Did Russian Cyber Forces Beat Their U.S. Adversaries in 2016? The Answers Is Rooted In The State Of Education In The U.S.
Why eleven World Chess Champions came from the USSR/Russia and only one came from the U.S. (https://en.wikipedia.org/wiki/World_Chess_Championship)? The discussion of why it is not a case is outside of the scope of this paper (http://www.teachology.xyz/3pc.htm). The statement I make is simple: people who during their school years do not learn how to reason, will not be able to reason when the need for logical reasoning will be knocking on the door (The 11th Law of TeachOlogy; http://www.teachology.xyz/6LT.html). The most important use of a logical reasoning in the everyday life is making predictions about possible events (The 33rd Law of TeachOlogy; http://www.teachology.xyz/6LT.html). Those predictions allow us to make preparations to face those events, or to alternate their results. 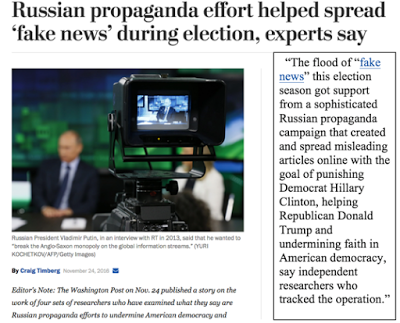 This is exactly what is happening right now (April, 2017) within the U.S. intelligence services – a reaction to the “unpredictable” Russian cyber “invasion” (https://www.washingtonpost.com/business/economy/russian-propaganda-effort-helped-spread-fake-news-during-election-experts-say/2016/11/24/793903b6-8a40-4ca9-b712-716af66098fe_story.html?utm_term=.­­3931175fa11f). P.S. Russian (or, for that matter, any other adversary's) intelligence forces saw an opportunity to use Facebook, Twitter, and Google to influence 2016 elections. This whole post has been based on the assumption that American intelligence forces did not see that coming and did not prepare the counter activities. But logically speaking, there are also other versions of the events.